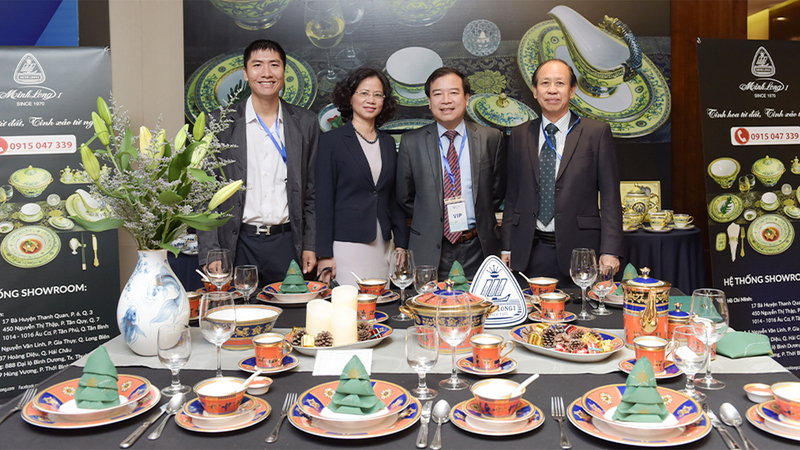 With high-quality products imbued with the national identity, the Binh Duong-based Minh Long I Ceramics and Porcelainwares Co. Ltd is proud to be one of the title sponsors for APEC Vietnam 2017. The company’s APEC jade cup was chosen as the gift to APEC leaders while its Hoang Lien tableware set was selected to serve at the State banquet of APEC Vietnam 2017. More than 40 sets of hi-end ceramic products by Minh Long were also displayed at the APEC International Media Centre and an exhibition entitled "Vietnam – We Mean Business” at the Ariyana Danang Exhibition & Convention Centre during the APEC Economic Leaders’ Week in the central city of Da Nang. 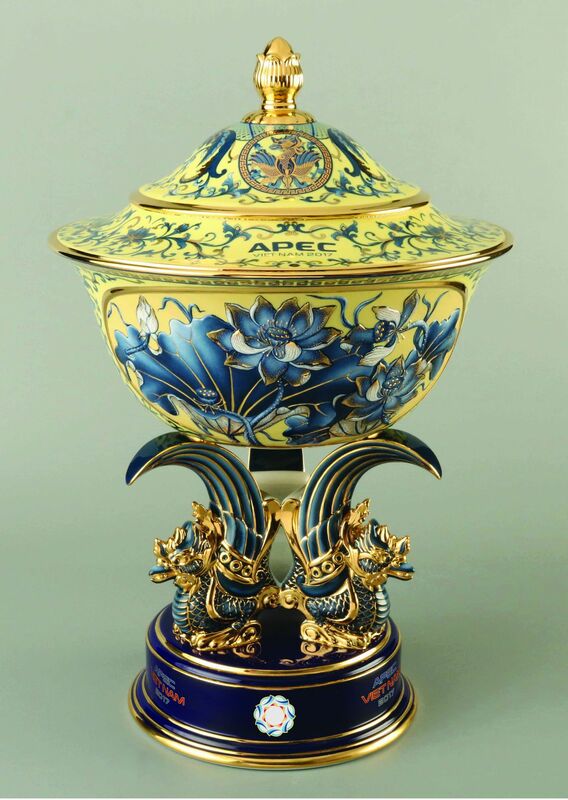 The products have diverse designs and sophisticated patterns bearing the unique features of Minh Long ceramics, drawing the attention of APEC delegates and reporters. The most prominent exhibits are some luxurious and classy products such as tableware sets with decorations inspired by ancient Vietnamese bronze drums and marine creatures and flower vases with lotus patterns on a yellow or turquoise glaze. Porcelain sculptures of mythical kylins, girl miniatures from the country’s three regions, and family-themed sculptures of maternal love, a grandfather with his grandchildren, and flower vases with delicate patterns of peach blossoms, apricot blossoms and five blessings, and some new products like gold inlaid porcelain coffee filter sets and bird, fish and chicken sculptures have also attracted great interest among delegates and correspondents. Gleb Zoubov, Director of Alpha Pacific Group, a Russian delegate to the Vietnam Business Summit and the APEC CEO Summit on November 7-10, said this was the first time he had visited Vietnam and Da Nang, and was really impressed with the exhibition and products displayed here, especially Minh Long ceramics. “The ceramic products are very good and excellent with interesting and unique designs and good quality,” he commented. “I like Minh Long ceramic and porcelain products very much. The products displayed here honour the traditional culture of Vietnam. They depict the daily life of Vietnamese people but have sophisticated and luxurious designs. It is very wonderful. These products are the quintessence of Vietnam ceramics,” said Alberto Salazar, a correspondent from the Cuban news agency Prensa Latina. His wife, Marta Elena LLanes Seco, who is also a reporter from the news agency, also showed her admiration at Minh Long products showcased at the International Media Centre. “I am impressed with Minh Long products. They are beautiful ceramic products bearing Vietnam’s cultural identity with images of lotus flower and dragon. I am very excited when being introduced to these products from colours to sophisticated decorative patterns, she said. According to Ly Ngoc Minh, General Director of the Minh Long I Ceramics and Porcelainwares Co. Ltd, when we heard that Vietnam would host APEC 2017 two years ago, we began to make preparations although we did not know whether we were selected or not. It took nearly one year and a half from forming the idea, designing to completing the set of products. 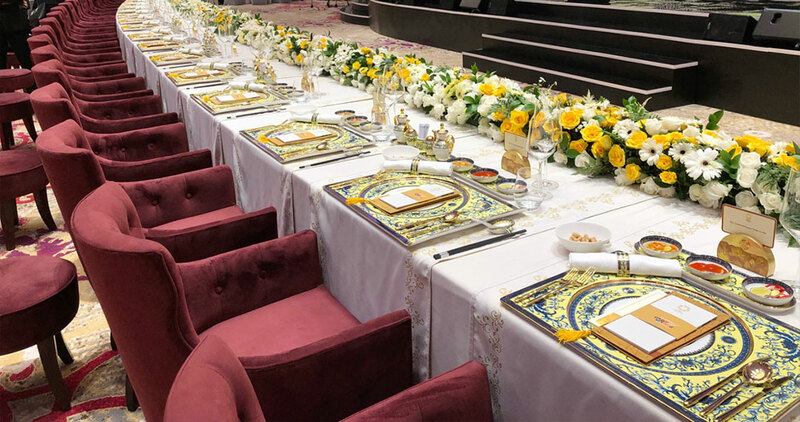 After being selected, close to 200 workers of the company worked for three to four months to create the tableware set to serve at the State banquet of APEC Vietnam 2017 and the gift presented to the APEC leaders, he said. This was the second time APEC had been held in Vietnam and also the second time Minh Long had accompanied the largest Asia-Pacific event. The APEC jade cup and the Hoang Lien tableware set were made in a subtle and elegant style with two main colours: light yellow and cobalt blue. Minh Long used the image of lotus flower - the national flower of Vietnam as the main pattern combined with the fern pattern, representing the nobility, simplicity, gentleness and permanence. To make these products, 16 different types of raw materials were bought from more than 10 countries around the world. Experiencing 30 important production stages, they were burned five times at 1,360 - 1,380 degrees Celsius. In APEC 2006 held in Hanoi, the APEC Cup manufactured by Minh Long was selected as the official gift to leaders of 21 member economies. 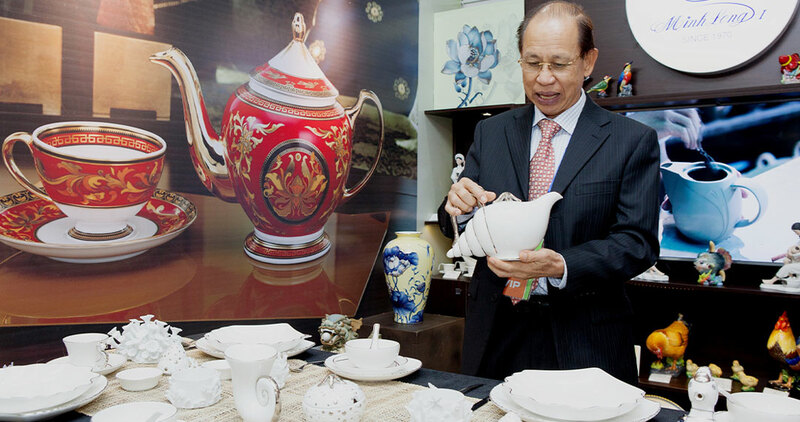 This is the honour and pride of not only Minh Long but also the entire Vietnamese ceramics sector, said Minh. “After finishing the tableware set, we felt very proud. It can be said that the tableware is as good as any luxury porcelain around the world by this moment, touching the culmination of art and technique that Minh Long has reached,” he said. “We aimed to introduce to international friends that Vietnam can produce high quality products for such important events as the national and international banquets. We are also proud to introduce the culture and quintessence of art of Vietnam to the world leaders and businesspeople through the story of lotus flower,” he added. Founded in 1970, Minh Long Company inherits a more-than-100-year ceramics-making tradition of the Ly family, starting from the grand-father of Ly Ngoc Minh. The company started investment in production for export in 1995 and now its products have been shipped to many countries in Europe and America. The rigorous selection of input materials, strong investment in modern equipment and machinery, and the application of advanced technology in production have brought about remarkable results. The company currently has more than 2,000 workers directly engaged in manufacturing, mostly of high-end fine art products exported to Japan, France and Germany, which are markets with high quality, technical and artistic requirements. Minh Long Company had exported before 1996, when it started to focus on the domestic market. After doing well at home, we returned to export. Minh Long ceramics is as good as any brand in the world. The brand of Minh Long ceramics has become well-known for German-standard quality and high technique. “I am sure that Minh Long has competitive capacity and great prospect for APEC economic integration,” said the company’s boss. The Minh Long I executives also attended the Vietnam Business Summit and the APEC CEO Summit along with their counterparts from several large local and foreign companies, and a gala dinner hosted by President Tran Dai Quang in honour of visiting APEC leaders, their spouses and business executives. 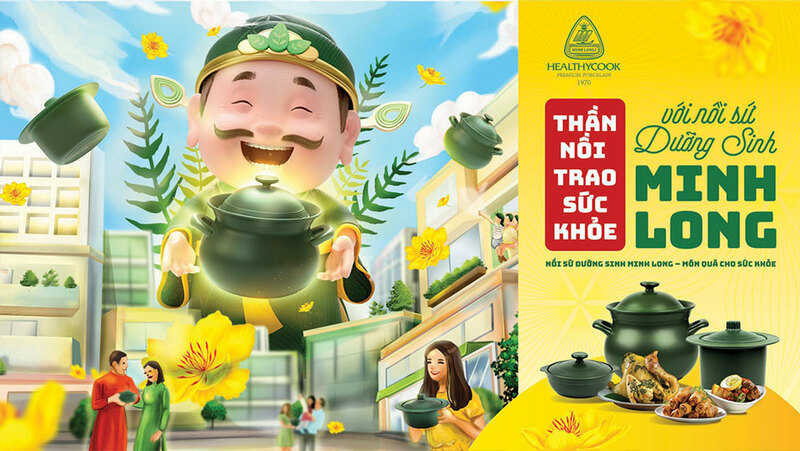 “Through this important event, Minh Long hopes to convey a meaningful cultural and diplomatic message through its high-quality indigenous products, which help promote the country and people of Vietnam to the world,” Minh said. 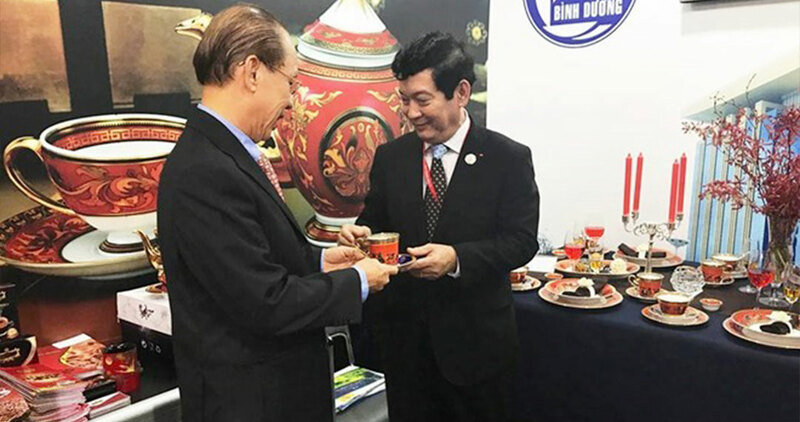 “From the company’s perspective, Minh Long hopes to be in the vanguard of Vietnam’s long-established porcelain industry and affirm Vietnamese brands can match the quality of any other in the region and world," he noted. The presence of Minh Long ceramics at this APEC Economic Leaders’ Week contributed to promoting the quintessence of Vietnamese ceramics in particular and honouring the unique products of Vietnam in general. 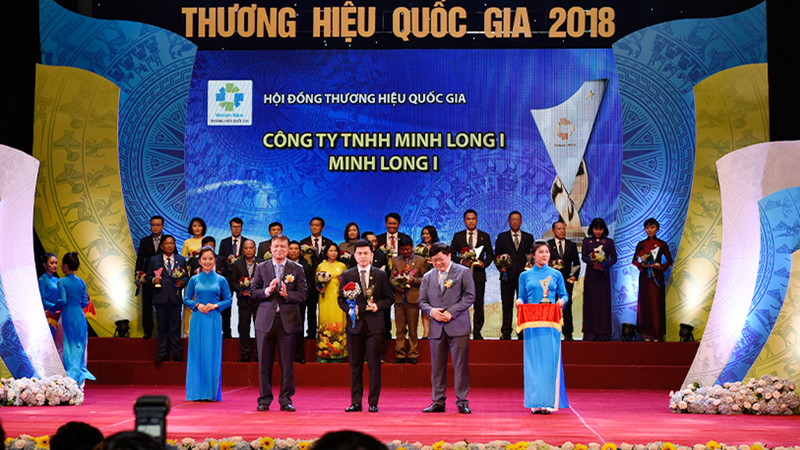 The participation of Minh Long and other enterprises also represented the Vietnamese business community’s commitment to accompanying the Party and State in making the APEC 2017 Economic Leaders’ Week a success. Through it, businesses will have opportunities to promote their brands and products as well as set up partnerships and sign agreements with Asia-Pacific firms. It is hours of creativity and meticulousness spilling in each brush stroke and shaping movements that form the Pig Sculpture’s joyful facial expression, realistic posture and artful patterns on its body. 333, Hung Loc, Hung Dinh. Thuan An, Binh Duong City, Viet Nam. District 3, Ho Chi Minh City, Viet Nam.